In the morning of February 16th, our NPO Health Policy Institute (HPI) held the annual “Medical Policy Summit” with our directors, advisors and members. The half-day meeting includes four panels focused on various issues on Japan’s health system. Based on our 3-year activity at HPI, it may be time to expand our scope to go global, thus this year, we held an international conference in the afternoon, “Global Health Summit: Advancing our promises for TICAD/G8 and Beyond”. The MC was NHK’s Ms. Doden. 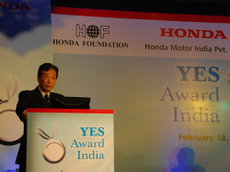 Former Prime Minister, Mr. Jun-ichiro Koizumi addressed the key note speech about “Food and Environment”. As may be expected, his speech was vibrant and fully attracted the audience. He talked for exactly 30 minutes without a manuscript or memo. His speech covered from beriberi, change of eating habits, longevity in Japan, the Japanese word “HENJIN” meaning “extraordinary” and not “eccentric, crazy”, his knowledge about Anjin Miura (William Adams) and scurvy, his visit to Miyako Island 2 days ago to see the process of sugar cane being produced into bioethanol and the resistance of the oil industry etc. Half of the participants came from overseas, but it was a wonderful opening. Ms. Sadako Ogata was traveling to Africa, so she addressed her greetings via video. 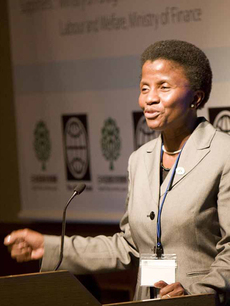 Then followed a speech from one of the Vice Presidents at The World Bank, Dr. Joy Phumaphi. Panel participants were Mr. Jay Naidoo, Chairman of the Board of the Global Alliance for Improved Nutrition (GAIN) and Development Bank of South Africa (whom I met in Davos during this year’s session with Bono), Dr. Tachi Yamada from the Bill and Melinda Gates Foundation whom I have referred to many times in my blog, Mr.Hiromasa Yonekura, President of Sumitomo Chemical which is globally well known for their outstanding effect of Olyset Net against malaria, Mr. Tadashi Yamamoto, President of Japan Center for International Exchange, known as the pioneer who started a real NPO in Japan and Ms. Akiko Maeda of The World Bank headquarters in Washington DC. With such distinguished members, we had a lot of fruitful discussion. For many of the Japanese audience, Japan’s contribution to Africa may have sounded something new. Mr. Koji Tsuruoka, Director-General of Ministry of Foreign Affairs made a speech on Japanese government’s view for TICAD, G8 Summit etc. To wrap up the conference, Mr. Yukio Hatoyama, Secretary General of The Democratic Party whose local is Toyako, where the next Summit will be held, addressed a message via video. They are all the global leaders of initiating Global Health. Dr. Naidoo’s 13 year-old daughter, who is a big fan of Japan, accompanied him to Japan for the first time. The reception was also very successful and I felt the high expectation towards Japan, being the hosting country for the upcoming TICAD and G8 Summit. The following day, on Sunday February 17th, there was a discussion session with people working for Global Health related NGO in Japan which was hosted by G8 NGO Forum. This also turned out to be very fruitful. As I repeatedly say, Japan is hosting big events this year; TICAD in May and G8 Summit in July which will attract great deal of attention worldwide. Most probably, it will be the last chance for Japan to host a G8 Summit. In that respect, this conference was held very timely and the output was successful. For an independent think tank like HPI to hold a conference with the support of The World Bank, Ministry of Foreign Affairs, Ministry of Finance, Ministry of Health, Labour and Welfare and the Bill & Melinda Gates Foundation etc. is a very open policy discussing process that is not necessarily led by the officials. 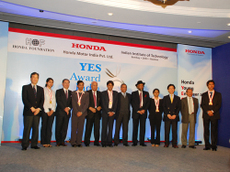 I felt that it was a conference that showed a glimpse of Japan’s direction in the global era. I would like to take this opportunity to express my sincere gratitude for the people who attended this conference. Also, many thanks to the staff that help organize this event! In this global world, as super-rich emerge, the poor become even poorer. Currently, out of the 6.6 billion world population, about 20% are the so-called “extreme poverty” class and face high death rates for mothers giving birth, infants and children under age of 5. Every year, millions of people die from hunger, malnutrition and diseases related to that. Especially poverty in Africa and South Asia is miserable. As our awareness towards global warming changes, production of bio fuel has increased, leading to the raise of corn and wheat prices. The world is moving to a critical direction. “2C”＝”Climate Change” and “3Ｆ”＝”Fuel, Food, and Feed” has a big impact to the people suffering from poverty. This is effecting heavily to the changes in global human society. On February 15th, we held a conference on “Global Health: Under-nutrition” with the support of The World Bank, Bill & Melinda Gates Foundation, Ministry of Health, Labour and Welfare, Ministry of Finance and Ministry of Foreign Affairs and other organizations. Dr. Tachi Yamada, President of Global Health Initiative at the Bill & Melinda Gates Foundation, made the closing remark and I did the welcome remark. During lunch, there was a wonderful speech from the Ghanaian Minister of Health and Welfare. In addition, the world’s leading medical journal “The Lancet” started to feature on world nutrition since this January. The article is based on data from vast evidence and finds issues, some what like building up data for what can be done. The real challenge is what we can really do to make a change. Japan is doing grass-roots ODA activities such as distributing iodine salt to Mongolia, something that is unique to Japan. School meals are good, but babies up to 1-2 years’ nutrition and supplying necessary elements (like iodine, iron etc.) is what is important. Especially breast-feeding should be the key nutrition for babies up to 6 months and if nutrition is not enough up to 1-2 years old, it will influence their lives later on like poor grades in school, and allowing themselves to be in a social level of facing unemployment and low wages. As this leads to unfortunate future for the children and gives great impact on the nation’s productivity, nutrition is indeed a big issue. Today’s conference was very enlightening for me and I thought is was good. Tomorrow will be the second day of the conference. Medecins San Frontieres or the Doctors Without Borders was established in 1971 by a group of French medical doctors and journalists in the wake of famine in Biafra, Nigeria. On February 1st, Co-founder of MSF, Dr. Xavier Emmanuelli visited my office with Dr. Tartiere and the French Embassy staff (photo). Photo: With Dr. Tartiere, me, Dr. Ememmuelli, Mr. Miaux and his Embassy staff, from left.. I showed him a few pictures of my daughter, an US educated medical doctor, who works in Los Angeles, when she was under MSF mission in Liberia for 6 months from April, 2006. It was time after Liberia elected Ms. Ellen Johnson-Sirleaf (whom I met in Davos last year) in November 2005, as its new President, well educated in US, and the nation was gradually moving toward stabilization and refugees were coming back from adjacent countries, Sierra Leone and Ivory Coast. My daughter told us that she met a good number of Japanese young helping Liberians and indeed, there are many young Japanese committed to such humanitarian causes and I am very proud of them. 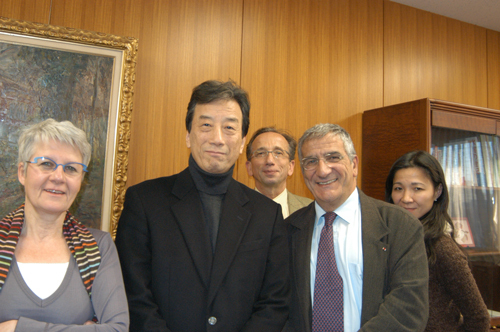 He told me that they visited Sanya, a slum in Tokyo, and this was a center of concern of MSF originated from SAMU or Service d’Aide Medicale d’Urgence, "Emergency Medical Assistance Service". We had a wonderful one hour discussing various humanitarian issues. In my previous report ‘From Davos, part 4’, I briefly mentioned that the world famous violist Akiko Suwanai was featured in Gala concert, a part of the closing events. She was fantastic and we all proud of her appearance. 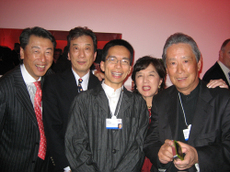 Several days later, I received an email from her saying that she sometimes visit my blogs and she noted that I was there in Davos, and invited me to her coming appearance in Tokyo. That was February 12th at Suntory Hall, and I went with my wife and we both enjoyed the program very much. The artists were Akiko Suwanai, Yury Bashmet (conductor and Viola) and Moscow Soloists, and all were absolutely wonderful. 5. WA Mozart: Serenade No 13 in G major ‘Eine Kleine Nachtmusik’ K525. Ms Suwanai played 2 and 3, and Yury Bashmet 2 and 4. My friend, Uniqlo’s Domae-san joined with us. After the concert we went to see her and her mother, then we found out we met her mother in some convention and with her briefly then. Blog works and we had an unexpected and wonderful evening with beautiful music and new friends. A recent article in Washington Post, Sunday February 3rd ‘For Japan, a Long, Slow Slide: Declines in Productivity, Population Combining to Stifle Economic Growth’ resonates with recent special issues on Japan as well as quite a number of books published in Japan and elsewhere. It is clear that Japan still needs powerful reform to re-build vibrant economy and not much time is left for Japan. The political situation may be a bit difficult to maneuver now, but has to act, and business must ‘act globally’ focusing on the core competence. 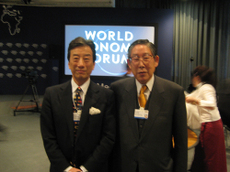 Business sector needs more Morita-san of SONY in 60s. I felt quite disturbed or uneasy in Davos of a session ‘Japan: A Forgotten Power?’ with a moderator and panelists being all Japanese. 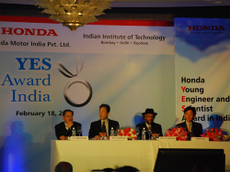 Similar sessions in the past always included non-Japanese experts in the panel. In fact, when I walked in the room toward the end of the session, there only a few non-Japanese in the room and the language spoken were understandably entirely Japanese (maybe someone, Japanese or non-Japanese, may have used English before I entered the room) and discussing mostly domestic issues, such as gender empowerment and immigration policy rather than what Japan’s role in globalized world: why not discuss domestic issues in Japan? Japan still is the world’s second largest economy in terms of nominal GDP, but It seems Japan wishes to withdraw itself from global affairs, at least me. 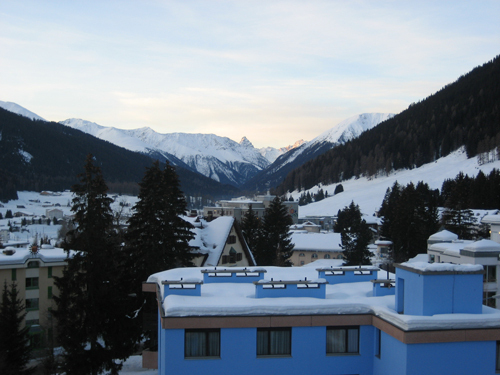 Attached here (photo 1), you’ll see the view from my hotel window this morning. The sharp edged mountain in the middle at the far back is Tinzenhorn, looking rather similar to Matterhorn. Here I am at the last day of the annual meeting. The Japanese Prime Minister Yasuo Fukuda arrived this morning to join the prominent others such as William Gates, Microsoft Corporation, USA; Tony Blair, former Prime Minister of the United Kingdom (1997-2007), Bono the famous musician, and so forth. 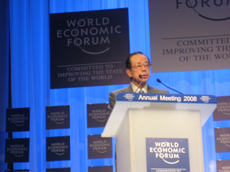 Fukuda’s plenary speech began at 1130 am in the main hall, co-hosted by professor Klaus Schwab, Founder and Executive Chairman, World Economic Forum, and Tony Blair. Myself sat in the very front row, together with Bono and his team. Our Prime Minister appeared understandably nervous, which made him talk a little faster than he had probably planned (photo 2). I was listening the simultaneous interpretation, one in English ? as is often the case, the interpreter appeared to be relying on the translated document in hand with some lapsed delivery rather than being simultaneous. The content of the speech was quality I thought though it had the room to be refined as a politician’s speech. 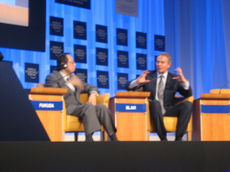 Both Tony Blair and Klaus Schwab asked several questions at him (photo 3). It was broadcasted on NHK so my friends emailed. I wonder what you have made of today’s event ? any reflections? Prior to the speech made by our Prime Minister, the main hall held a plenary seminar on the world economy, fully packed. The panel included Laurence Sommers, the former Treasury Secretary during the Clinton era, who is an extremely talented economist though also known for jeopardising his career as the President at Harvard University through failing to accord his public comment to the gender-equal matter. Anyhow, the economic outlook projected was bleak. The theme of this seminar spilled onto the session with our Prime Minister whereby he was asked a question on the world economic trend. It was felt that his response could have better embraced the mood of the speaker panel though I must say the support team was perhaps already operating at the capacity more than expected. I must acknowledge that facilitating the Japanese Prime Minister to join the forum is already a remarkable achievement; the last was with then the Prime Minister Mori several years ago. 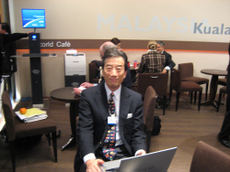 I’d like to pay respect and send my warm regards both to the Prime Minister Fukuda and the support team, and in fact also wish all the best for affirmed efforts around the TICAD and G8 in coming May and July respectively, ultimately for all people concerned including the general public in Japan. After the forum, our Prime Minister joined a luncheon with the various business leaders. Having dealt with interviews for CNN, and so forth, he was quickly on his return home. photo 6: me working hard at the conference! My evening began at the ‘Tokyo reception’ at a hotel. 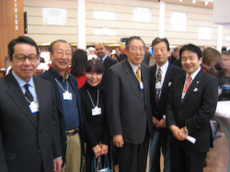 The Governor of Tokyo Shintaro Ishihara was unable to join thus the Vice Governor Naoki Inose replaced his place as the host. Then, the official Forum closing evening began with the concert, featuring the world reknowned violinist Ms Akiko Suwanai ? Bruch’s ‘Concert No. 1’, – the second piece was Mussorgsky’s ‘Pictures at an Exhibition’. It was the first time for me to hear this latter piece right through to the end. Suwanai san, it was truly wonderful. It confirms my view that it tends to be women rather than men who tend to be ones radiant at the world stage among the Japanese. At an individual or personal level, the presence of Japanese female tends to be more defined compared to what Japanese male in general is able to exercise. At the back of my mind here is the strong tendency of Japanese men to acquire the viable self through organisational affiliations. 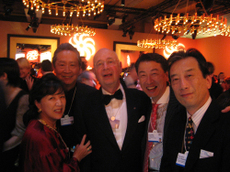 As always indeed, the radiant Japanese face of the Davos Forum was our honourable Madame Sadako Ogata. Soiree followed the concert ? this year, it featured Turkey with Turkish cuisine, which we enjoy very much. Professor Maeda holds a place at MIT, and is a prominent professor at MIT’s famous Media Lab, though he is apparently venturing out to take up a presidency at Rhode Island School of Design from June. I do like that spirit. We much need a persona like him in the Japanese academia ? to stimulate the research, and initiatives of universities, students, and young people in general. 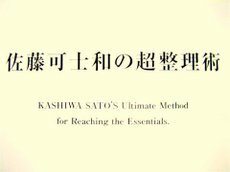 As I always say, among the crucial social resources is ‘Kojin Ryoku’ or indivisual power and uniqueness, a creative synthesis of the self exercised at the personal level.